Winter is all about comfort food. I know November is supposed to be autumn but it really feels like winter and all I want is filling shepherds pie, homemade soups, stews, bakes and puddings. It's funny how our body wants food like this when it starts to get chilly outside. It's warm indoors, but it doesn't stop those cravings. One of my favourite puddings (apart from anything with custard) is rice pudding. My mum always made rice pudding when I was growing up and there's nothing like homemade rice pudding. It has to be made in a pot or in the microwave and not baked. Skin on a rice pudding is a big no-no. Rice pudding should always be rich and creamy and never have a skin. I usually make it quite simply with a bit of sugar and lots of freshly ground nutmeg, but today I'm bringing you something altogether more luxurious. I made the rice the same way as usual, but added some ginger instead of nutmeg and topped the rice with soft slices of banana in a hot toffee sauce. Just glorious. I made this dish with whole milk for Cooper as he really needs the calories (he is growing so quickly and runs everywhere), but I use coconut or nut milk for Graham's. It's rather fab too, just not as rich. A creamy rice pudding that can be made with dairy or nut milk that's really easy to make. Topped off with slices of soft banana in a hot toffee sauce for a bit of luxury. 1. Pour the rice into a large pan, along with the milk and sugar. Bring to the boil, then turn the heat down low and cook until the rice is creamy and tender. This should take about 20 – 30 minutes. Make sure you stir it regularly, so it doesn't stick. Stir in the vanilla. 2. Heat the sugar and water in a pan, until it forms a caramel, don’t stir the mixture, just leave it to develop. 3. When the caramel is golden, add the butter (or dairy free spread) to the pan and heat for another couple of minutes, then add the banana slices to the pan, shaking to coat them well. 4. 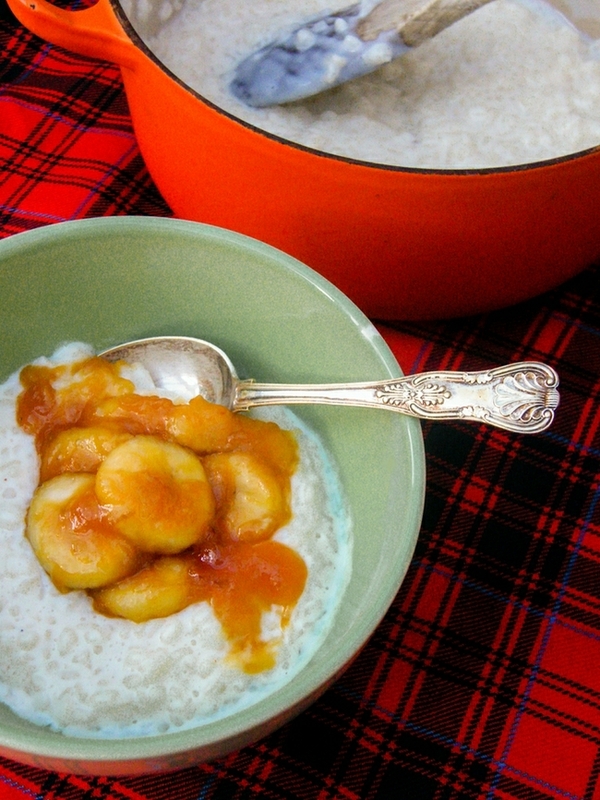 Serve the rice pudding in bowls topped with the bananas in toffee sauce. 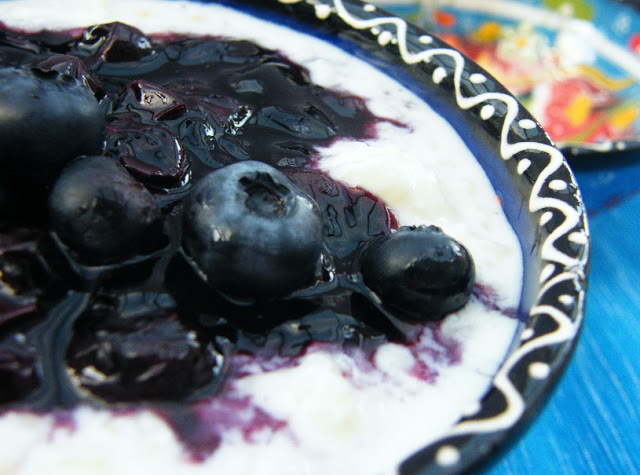 If you liked this pudding why not try my rice pudding topped with boozy berry compote? Yes they are fab and so good on the rice. We do love rice pudding; it's one of my daughter's favourite comfort food. Me too, it is so good. I'm not sure puddings get much better than this; especially at this time of year. A big bowl full of this right now is just what I need! I know what you mean. I wish I had some left. Well they do say great minds think alike. The toffee bananas look incredible. I love rice pudding but unlike you I quite like baking it and am happy with a skin (the only time I can tolerate a milk skin). However I don't make it often. My mum tells me that if you make it on the stovetop it is creamed rice but I don't know if that is a widely held view! Oh god no, I hate skin on it. I suppose it could be called creamed rice. We've always called it rice pudding. 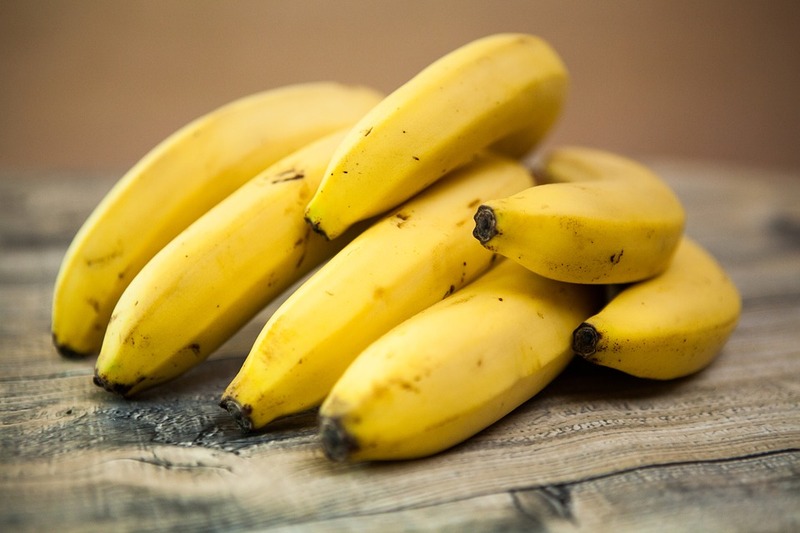 I love banana anything so this is a real winner in my book. You know I am the same with rice pudding, I love it but it must be made in a pan I hate the skin on it when it bakes. I grew up on it made in the oven and never liked it until I tried it as an adult in a pan and loved it! I am with you there, has to be made in a pan and creamy. No skin EVER!